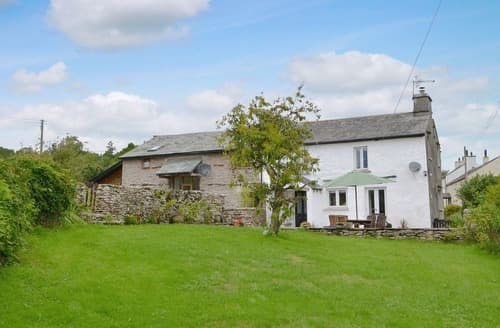 What our customers are saying about our Holiday Cottages In Crosthwaite To Rent. "We were pleased that the owner arranged for our sheets and towels to be washed in non-bio washing powder although with the number of people these days that have allergies I’m surprised that that isn’t the norm.We were, however, very disappointed with several aspects of the property. The microwave is almost impossible to set to a required cooking time as the rotary time control appears to be a random number generator. The turntable of the alternative microwave in the utility area didn't go round and, on full power at least, the heating didn't work. It did however ding at the end of the time period. The dishwasher top drawer stops were non existent so the top drawer fell off the runners and broke some glasses and a plate. Also there was a wheel missing off the bottom drawer making it difficult to slide that in and out when loaded. The total cost of replacement parts is less than £10 so I cannot see why they have not been replaced. One of the fridges had no shelves and no door shelf so that the only way to use it was to stack everything up from the bottom. We found that things that were sitting on the bottom near the back and stacked at the back froze from being in contact with the back creating problems when things like ham and pate were taken out to prepare lunches. Several bulbs in lights and table lamps were not working due to blown bulbs and fuse. Our electrician son sorted that out. Many of the doors have twisted and some of the door ironmongery is worn so that doors don't close properly. Some of these points have been raised in reviews of the property so it is extremely disappointing that nothing has been done to correct them. Other things that are very difficult to cope with are that there is no sound deadening in the floor construction underneath the hardwood floor of the living area so that any early rising dish washer fairy can wake up everyone else in the bedrooms below very easily. There was a strong smell of damp in several of the bedrooms with the small nursery room being the worst.Those were the material things but there were other things that made for a less than enjoyable stay in the first few days. There was a local power cut when we arrived so nothing electrical including the heating was working. This might not have been so bad if a) the building had been heated for the previous week or, considering the conditions, if the heating had been turned on for a couple of days before we arrived, b) if the weather outside had not been very windy and freezing cold and c) if a welcome basket of logs was available to get some heat out of the stove. As it was it took two days or so to get the place anywhere near a comfortable temperature. We also had to use a hairdryer for quite a long period on the first night to take the bitter chill out of our bed before we could contemplate getting into it. It was fortunate for the other members of our party that bad weather prevented them from arriving until the next day. Another thing was the cleanliness of the place. The kitchen cupboard doors were far from clean as was the wall to the right hand side of the cupboards. There were some substantial cobwebs up around some of the roof timbers and the stairs were quite dusty as was underneath the beds. Some of this could be due to the power cut but the general malaise of the place suggests otherwise. It could really do with a deep clean and a makeover or replacement of the defective kitchen equipment to bring it up to the standard suggested in the property description." "Just returned from a 2 week stay, with friends, at S18538. On arrival we had to wash all the tea mugs before we could use them as they looked as if they hadn't been washed. 2 days in we found out why. The dishwasher was disgusting. We had to totally strip the machine to clean it. The filters were totally clogged that it took 4 attempts to get it clean. We feel that we shouldn't have had to do this while on holiday. 2 days later we tried to use the tumble dryer to dry some clothes but the condenser tank was so full of water that an error message was displayed. On emptying it was clear that it had not been emptied for some time. It can't possibly be right that guests, on holiday, staying at S18538 should be expected to carry out maintenance on the equipment. The bedrooms, being downstairs, were very dark as the windows were so small. We were slightly concerned as to how it would be possible to escape if there was a fire. None of the Windows in the property were big enough for an adult to escape. All bedrooms smelt very musty. Luckily we had good weather and when we were there we were able to open all the doors and windows to allow some airto circulate. The heating in all of the bedrooms was woefully inadequate. As for cleanliness there were, what looked like, dog hairs on the backs of the fabric sofas. Dust was thick underneath all of the seating. We had never seen so many cobwebs. In the lounge area above the leather sofa is a huge cobweb which looked as if it had been there for years. The ceiling was covered in cobwebs. My husband and I slept in the double ensuite where the ceiling was covered in cobwebs. The double room adjoined to the baby room had large stains on the carpet. Many of the kitchen cupboard doors were really dirty. All of the Windows in the property were dirty. No idea when they were last cleaned. Considering the cottage sleeps 8 there are only 2 bathrooms and 2 toilets. It was a scramble in the mornings for 8 people to shower with only 2 showers. There was a severe lack of coat hangers. We had to go out and buy some. I tried to call the owners but my calls went to answerphone. No call was returned. Considering the amount of money we paid we were very disappointed. The standard of this property lacked in so many ways. We will never stay there again." "Amazing and stunning. 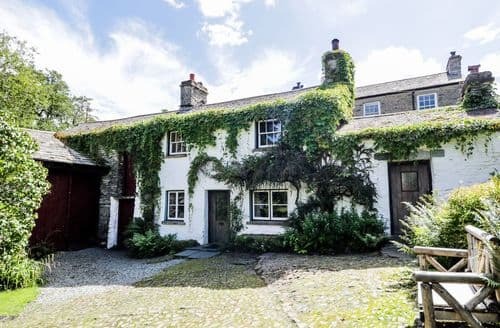 We will be talking about this wonderful cottage for years to come. Lovely setting, beautiful stream to watch the yellow wagtails (and heron!) right outside the door. Everything you would think of for your own home was here. Meeting the owners was a joy also. Highly recommended.Such a nice experience and lovely to be able to take our dog. We met the owners who were wonderful and provided lots of useful info re walks and local pubs. Highly recommendWe loved this cottage, so peaceful and pretty area. 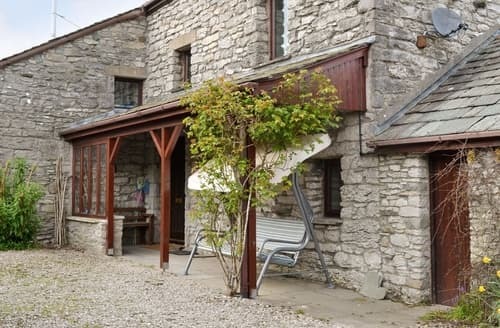 Not too far from Kendal or Bowness. Owners were lovely too. 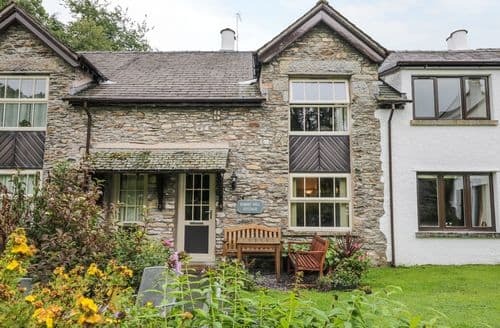 Great facilities and will definitely be back :)Excellent cottage - would definitely recommend. The owners were there when we arrived and showed us how everything worked which was really helpful. They had even left us a bottle of fizz for NYE. Even in Dec/Jan the cottage was warm and cosy. The kitchen was so well equpped and there were lots of Dvds, books and games for those rainy days. The location was spectacular, quiet and peaceful - you drove down to the mill - so picturesque and the stream was beautiful. Nearby pubs were plentiful within a 5 mile radius." "What a wonderful find S44675 was! 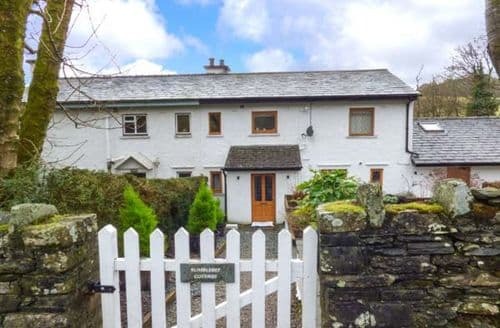 It felt more like a house swap than a holiday rental. Everything you could possibly wish for during a holiday. From the welcome pack on arrival to a cupboard full of every conceivable utensil even a jam making pan and food processor. The house was large enough for three teenage boys and two dogs to find their own space. The garden was secure for the most important members of the family and internal doors meant we could restrict wondering while home on rainy days. We could have spent every day sat in front of the wood burner watching the many available DVD's or start to read the huge selection of wonderful books. To be honest I could move into S44675 tomorrow! The situation of the cottage is quite remote but wasn't a problem infact after a long day walking it was lovely to get back to a peaceful location. Perfect for chilling with a Gin&T and a BBQ on the decking. Pity we can't keep S44675 a secret as we will definitely be returning next year." "Booked absolute last minute. Found online on Sat, arrived for a four night stay on the Monday. 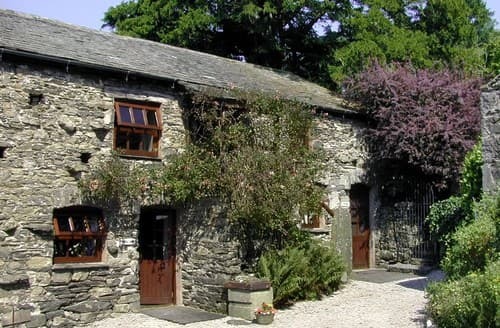 Expected little with the short notice, but how amazed we were to find this charming, cosy and homely little haven. We were made extremely welcome by Logan, who took his time showing us how to work the wonderful Aga, told us some of the history of the beautiful cottage, and showed us around. I'm very impressed that the fuel for the fire didn't cost extra. 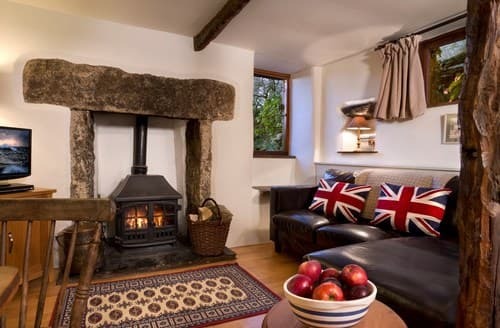 The traditional feel of the cottage adds to the experience. You'd be forgiven for thinking you'd gone back in time....with all mod cons thrown in too! Clean, cosy, welcoming and friendly. Out of the way enough to be peaceful, but close enough to towns and amenities for convenience. My little girls loved their stay in "Mrs Tiggywinkles Cottage", with so many wonderful features. We will definitely return,"